I’ve been reading posts about how Customer Experience is the new Marketing. In a nutshell, marketing is all about communicating with people to influence them to buy from you. On the other side, is Customer Experience. Thus, customer experience focuses on the entire customer journey. If done well, customer experience is in place before you even have initial contact with the customer and continues throughout the course of the relationship. Marketing isn’t involved in the entire customer journey. Marketing directs the awareness and consideration phases. It has limited involvement in the purchase phase. Sales handles that. Marketing is typically not involved in the post-purchase phases of retention, loyalty, and advocacy. Sales and Customer Service tend to handle those touch points. Onboarding can be the difference in whether a customer churns or not. Some organizations bypass onboarding altogether and then wonder why that customer left. Customer strategist Esteban Kolsky found in his research that 11% of customer churn can be avoided by simple company outreach. It still surprises me that marketing departments still opt to focus more on acquisition than retention. It is clear that recurring revenue is the number one statistic companies should focus on (churn is a close number two). We know that it costs much more to get a new customer than it does to keep one. Eventually, the message will sink in. But the time that it takes to do so may harm both customer and brand. In comparison, Customer Experience encompasses the entire customer journey. Customer Experience can get siloed in Marketing. When Marketing takes ownership of Customer Experience, things tend to go south fast. For the most part, Marketing puts a stronger priority on acquisition than retention. As a result, customer experience can stall out and hurt customer and brand. Customer experience occurs across an organization. Its goal is to provide the framework for an organization to be able to deliver a consistent, personalized experience across all channels and touchpoints. The entire organization is supposed to ensure that customers receive the experience they want. That means every employee – from leadership to the front lines – needs to understand what the company’s customer experience vision is, why it is important, and how their role fits into that vision. In essence, each employee has a role to fill in the customer experience vision and they must take ownership for customer experience to generate optimum results. Those are big shoes for Marketing to fill. Which is why, in a recent CMO Council and Deloitte study, only six percent of CMO respondents said they are defining routes to revenue across all facets of their business globally. But, if functional groups aren’t aligned, how is the customer going to receive a consistent experience? They won’t. And they aren’t. According to a CEI Survey, 86% of buyers will pay more for a better customer experience. But only 1% of customers feel that vendors consistently meet their expectations. As Michael Brenner, CEO at Marketing Insider Group, notes “…for too many marketers, improving customer experience means making the buying experience more ‘seamless’ or having ‘less friction. '” He is right. This is a limited view. Unfortunately, until marketers start changing their mindset to realize that their role encompasses both the acquisition and retention sides of the customer, the organization’s customer experience initiative will fail. So, how is Customer Experience the new Marketing, again? But I do understand why people think so. Companies get that post-purchase phases drive customer growth. Having a strong customer experience effort is the reason for that. As the Temkin Group has shown through its research, customer experience leaders have more than a 16 percentage point advantage over customer experience laggards in consumers’ willingness to buy more, their reluctance to switch business away, and their likelihood to recommend. Genesys has found that the top three reasons why businesses proactively manage and invest in customer experience are to (1) improve customer retention, (2) improve customer satisfaction, and (3) increase cross-selling/upselling. But even though customer experience leaders, when compared with customer experience laggards, enjoy stronger financial results, Temkin Group found that in its 2017 research, only eight percent of companies view themselves as industry leaders in customer experience today, 55 percent aspire to be leaders within three years. Marketing is a spoke in the customer experience wheel that drives profitability and growth. As I noted above, customer experience happens across the organization. Marketing must understand its role in the overall customer experience vision and take ownership of it. Customer acquisition is not the end-game. First, Marketing needs to transform from a product focus to an experience focus. Second, Marketing needs to understand that it sets the tone for the type of experience the customer will have. If Marketing can grasp this fact, it will be able to understand that it must focus on post-purchase activities as much as, and maybe more than, acquisition activities. According to Gartner, customer experience is a leading driver to ensure a true omnichannel experience (consistent messaging across channels). And Marketing can help lead this effort. Third, Marketing needs to shift so it focuses on customer lifetime value. Customer lifetime value should be the prime focus of every organization. Customer lifetime value is what drives growth. It is a very important metric, which is why more than 75% of North American executives deem customer lifetime value a vital indicator of success. Which brings us back to customer experience. According to Econsultancy, 64% of companies rate customer experience as the best tactic for improving customer lifetime value. We’re in the “age of the customer”, as Forrester calls it. The importance of customer experience on a company’s future growth trajectory is very clear. So, while it is easy and comfortable to say Customer Experience is the new marketing, it isn’t. 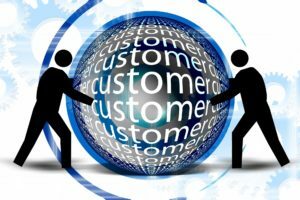 Customer Experience is the conduit to help Marketing transform so it is a valuable piece of the entire customer experience vision.